The main objectives of the crafts program are to provide an enriching experience and to instill and develop a lasting love and appreciation for working with wood. The curriculum is designed to broaden a boy’s knowledge and expertise in working with his hands in a creative manner, which may yield practical benefits at another time in life. Use of the basic hand tools is stressed—different types of saws, rasps and files. Boys choose their individual projects from a range of possibilities. A wide variety of objects are made: from toys, models and animal sculptures to useful objects like letter openers, spoons, cutting boards and salad bowls. Crafts begins in Class I, and classes are small to facilitate individual attention. 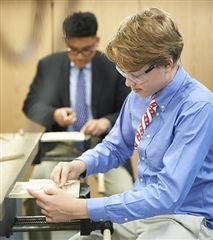 It is Buckley's oldest tradition: every boy carves an eight-inch square plaque before he graduates. Almost three thousand student plaques hang on the walls of the School, dating back to 1917, the first year a boy graduated from Buckley. Each plaque must have the student's name and the years he attended the School, but the rest of the design is up to him. Boys carve everything from symbols and logos to sailboats and cartoon characters. The plaque is not just the culmination of the crafts program, it represents a graduate's legacy, and alumni are often seen scanning the walls when they return, hoping to catch a glimpse of their plaque.